Having a beach party or just want keep the sun shining all year around? 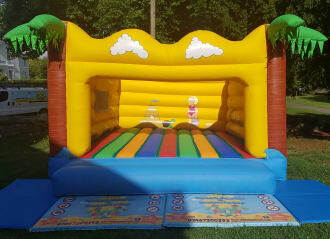 Let the children have great fun on this beached themed bouncy castle with Palm Trees. Have you also seen our Ultimate Beach Package which includes a Giant Inflatable Limbo, matching Ball Pool & Didi Cars? This inflatable bouncy castle is suitable for ages 14 and under. This bouncy castle has been manufactured here in the UK using high quality material and complies with the UK / EU standard (BS EN 14960:2013) and is annually tested to meet these regulations. A wonderful looking bouncy castle with bright material used throughout with excellent hand painted artwork. Customers can book online through this product listing by clicking the "Click here to book online" button (This is our preferred booking method) Alternatively, if you fancy a chat with us then please call any time/day of the week. Please be aware that due to weekends being our busiest time of the week we may not be able to take your call or enquiry. If you would like to email any questions or queries, you can contact us by email: info@rivieraevents.co.uk or over on our facebook page. Absolutely fantastic experience using this company for a bouncy castle at my wedding in August. The service was brilliant, constant communication and nothing was too much trouble. They even came back to the venue to dry the bouncy castle after it had rained! Kids and adults loved the castle and it really added something fun and special to our day for our guests. Thank you! 5 STARS! Asked for a slot for an Elf visit - Anthony went out of his way to accommodate us. Arrived bang on time and kids both amazed by him. Costume amazing and so realistic in mannerisms. Absolutely recommend- worth every penny for their faces and excitement well after Elf left. Thank you! No images available at the moment. Riviera Events © 2019. All rights reserved.